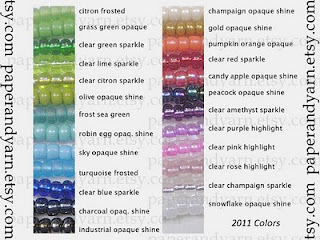 Along with the new studio hullabaloo I've been updating our etsy shop with new Valentine's Day themed goodies and also a brand new color chart of available beads for customizing your stitch markers. Hope everyone is gearing up for our first Holiday Handmades Gift Bank© project. Fetching Mitts is a free pattern available through knitty.com. Please be sure to include HHGB2011 in you tags on Ravelry so we can sneak a peek.